To stay up off the horse’s back and avoid hindering it as it makes the “bascule” shape over a jump. To give the rider security and the ability to sit to any changes in balance that the horse might make during the movement. To allow the hands to move further up the horse’s neck to avoid hurting its mouth as it lifts off. To adopt this position, you will need to use your body like a pendulum-all your weight should be based in the lower part of the legs, while the top half of your body remains extremely lightweight and flexible. Your legs need to be reasonably strong to achieve this, so work toward building them up either through cycling or hacking with shorter stirrups, which will help to develop the calf and thigh muscles. This additional fitness will vastly improve your jumping seat, as it will give you the strength to balance evenly over the horse’s back, particularly during cross-country events when the rider needs to assume the jumping position for much longer periods of time. Your lower leg (from the knee down) is the anchor that will prevent you from becoming unseated. Take time to watch professional riders jumping on television or at competitions and notice how this part of the leg completely absorbs the movement yet never moves from the horse’s side-aim to emulate this by holding your calf firmly against the saddle but without overgripping. To improve your stability further, as you adopt the jumping position, imagine heavy weights hanging from your lower body, pulling your waist and bottom backward toward the hind feet of the horse-this will encourage a deeper seat and keep your balance in direct proportion to the movement of the horse. 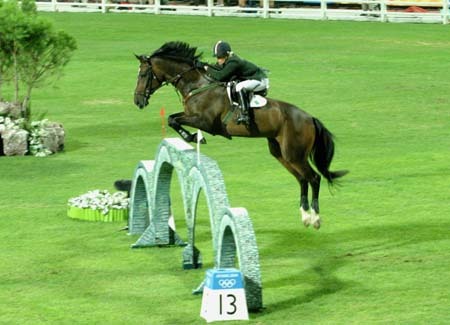 The jumping position is only assumed briefly while the horse is in the air over the fence: the rest of the time you should sit lightly in the saddle, maintaining a flexible upper body with relaxed shoulders, arms and wrists and keeping your hands low and still on the horse’s neck. An experienced rider tackling a cross­country course can make riding look like a real art form-their legs and bodies completely absorb the movements, and to an onlooker the rider hardly seems to move in the saddle. To ride like this is certainly something to aspire to.